As our rig gets closer to the 4wd conversion we have been thinking about how to mount a spare fuel can to the back of the vehicle. Am planning on getting an Aluminess spare tire carrier that will mount behind the factory step bumper. That will take up the spot where the five gallon fuel can currently resides. Would prefer not to add a passenger side swing arm and box. Would appreciate photos, descriptions, or product recommendations of how others have solved this problem. I'm either route-planning from gas station to gas station*, or I have a 5 gallon jug with a spill-tastic carb compliant nozzle ratchet strapped to the roof rack. I do carry a funnel, so at least I don't have to use the nozzle. This may be the single jankiest thing about my van. I was all set to send a rotopax to a friend with an OR address and have them mail it on to me in CA, but then I found some very so-so accounts of them after a year of use. * Recently I ended up adding ~150 miles to a trip, because an out and back route turned out to not a have fuel at the turn around point. I've got a rotopax behind the passenger side Aluminess swingarm. It won't easily fit behind the driver's side spare tire swingarm. It works great, I had no issues buying one online and having it shipped to CA. The rotopax has gotten regular use for a couple of years as moto support without issue. The only PITA is that the cap can be tough to unscrew. I've been trying to think of the name of these for years. Zeta (username, Tom real name) had them on his van but he sold it and isn't on the forum these days. I found these two pics in his album but no pics of the one he had on his van. It may be a stretch weightwise for an Aluminess spare carrier but I thought it was a neat setup which gave you flat storage to put anything on top of your spare. 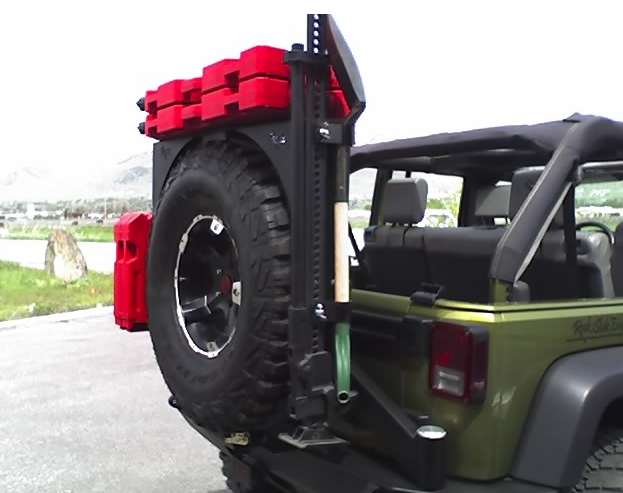 I was wondering if this Smittybilt 2739 I-Rack Mounting System with gas can mount would work and not be too heavy on an Aluminess tire carrier. I found these two pics in his album but no pics of the one he had on his van. That's a great idea. If it stressed the Aluminess swing out too much you could use that jack to transfer some of the load to the bumper, just jack it up a notch or two. I've been trying to think of the name of these for years. Those are made by Rock Slide Engineering, $290 at 4Wheel Parts. Was looking at those as well as the I-Rack system too. Not sure how the swing arm will handle the additional outboard weight either. Thought about putting a fuel can up on my roof rack and moving the Tred-Pros to the spare tire. Am concerned that it is a lot of weight to put up there and take down when needed. Boy wonder, how large is your RotoPax? That may be the way to go. Can you post a photo of Howe it is mounted? Am getting the Agile 45 gallon fuel tank upgrade so not sure I will even need an extra fuel can. The Triton seems to be pretty fuel efficient on the back roads. Thought about putting a fuel can up on my roof rack and moving the Tred-Pros to the spare tire. Am concerned that it is a lot of weight to put up there and take down when needed. .
No need to remove them, simply use a siphon hose between the roof can and the main tank. Probably don't want to fill them up there though. I happened to be searching "rotopax" and found the pictures/thread on the setup 86Scotty mentioned. 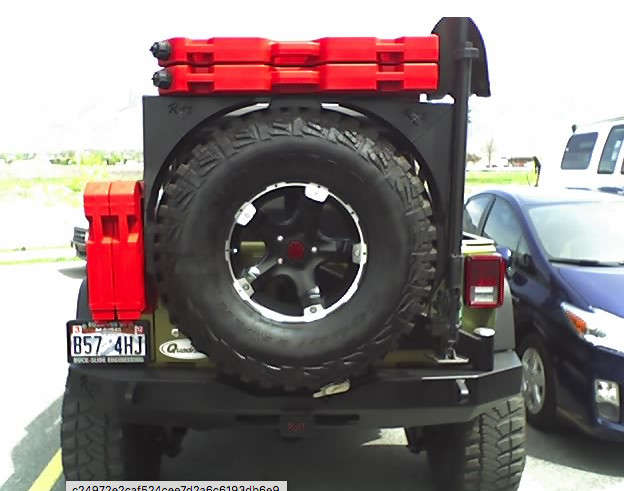 I don't know if it would be a direct fit to the Aluminess tire holder, but there are a few different configurations for different Jeeps, and one might be close enough that it would be a direct fit, or only need slight modifications.